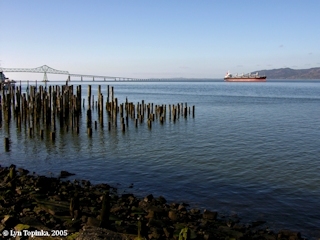 Click image to enlarge Columbia River as seen from Astoria, Oregon. The Astoria-Megler Bridge is on the left and Point Ellice, Washington, is on the right, behind the ship. Image taken February 19, 2005. In 1805 Lewis and Clark could not cross the Columbia River at its mouth, causing them to retrace their steps back up the Washington shore to cross near the narrower area near Pillar Rock. For years afterwards crossing the Columbia was a problem. In 1840 the first ferry service began across the Columbia River. Solomon Smith, Astoria's first school teacher, connected two canoes together and began carrying passengers and cargo. During the heyday of Steamboats there were two landings accessing the north side of the Columbia River, with one landing at Ilwaco and the other landing at Willapa Bay. In 1889 the Ilwaco Railway and Navigation Company built a narrow gauge railway connecting the two points, with the tracks extending out onto the docks at both locations. In 1908 the landing moved from Ilwaco upstream to Megler and a much larger facility. The railroad and the steamers, such as the "T.J. Potter", were under the control of the Union Pacific Railroad. In 1915 construction was completed on the Columbia River Highway (today's Highway 30) linking Astoria and Portland. Demand for steamer travel fell off, with the "Harvest Queen" making the last steamer run to Astoria in 1921. Along with the new highway to Astoria came a demand for reliable ferry service from Astoria to Washington State. In 1921 Captain Fritz Elfving created a ferry service between Astoria and McGowan with a ferry named "The Tourist". Between 1927 and 1930 the Union Pacific Railroad tried to compete with Captain Elfving by running a ferry between Astoria and Megler. In 1932 Elfving bought out the competition and combined the two companies, relocating all ferry landings to Megler, a better location for a landing than McGowan. The 1941 The New Washington: A Guide to the Evergreen State, Federal Writers' Project, 1941 mentions a ferry from Astoria to Knappton. "... South of Naselle on State 12-B is KNAPPTON, 7.9m, (133 alt., 39 pop. ), a cluster of ancient buildings around a ferry slip. The KNAPPTON-ASTORIA FERRY (car and driver, $1; passengers, 25c; 4 times daily) crosses the Columbia River to Oregon. ..."
In 1946 the State of Oregon purchased Captain Elfving's company and assigned the operation to the State Highway Department (today's ODOT). This ferry service allowed people to travel along with their vehicles from Oregon to Washington. In good weather, a one way trip took about one half hour. The opening of the Astoria to Megler Bridge in 1966 was the end of the Astoria to Washington State ferries. The last ferry run was the "M.R. Chessman" on July 28, 1966. 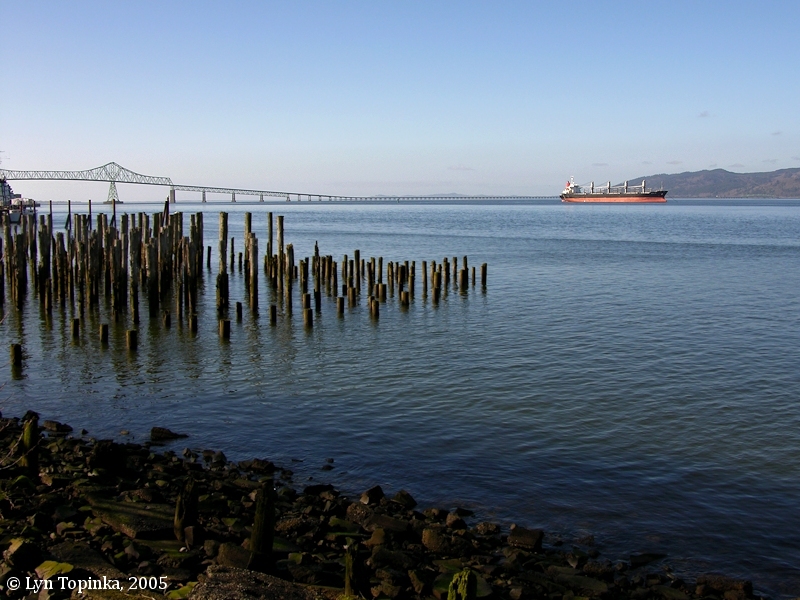 Click image to enlarge 14th Street Pilot Station and the old ferry landing, Astoria, Oregon. View from moving car. Image taken October 25, 2011. 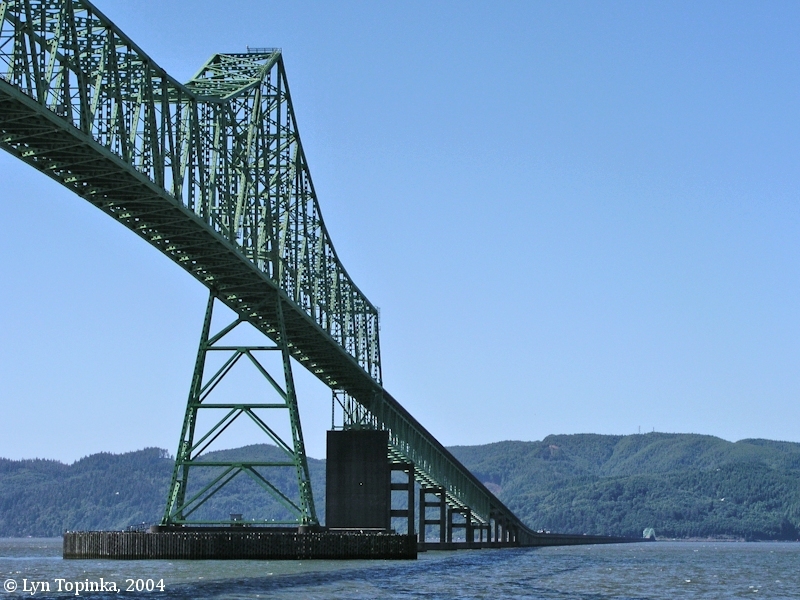 The Astoria-Megler Bridge stretches 4.1 miles (21,474 feet) from Astoria, Oregon, across the mouth of the Columbia River, to Point Ellice, Washington, at Columbia River Mile (RM) 14. The bridge replaced previous ferry lines running from Washington to Oregon. Click image to enlarge Astoria-Megler Bridge, from Astoria, Oregon. Image taken June 16, 2004. The early 1900s was the "Golden Age of Postcards", with the "Penny Postcard" being a popular way to send greetings to family and friends. Today the Penny Postcards have become a snapshot of history. Click image to enlarge Penny Postcard: Astoria-Megler Ferry, Tourist No.2. Penny Postcard, "Astoria-Megler Ferry". Caption on back reads: "Tourist No.2, Astoria, Oregon-Megler, Washington Ferry. This ferry connects Pacific Coast Highway 101 across the mouth of the Columbia River. The 10 mile trip takes approximately 30 minutes." Published by Anderson Sundry Co., Portland, Oregon. Color by Mel Anderson. In the private collection of Lyn Topinka. The "Tourist No.2" Ferry was one of the ferries used on the Astoria-Megler route. The ferry was a wooden-hulled vessel, 110-feet long and 36-feet wide which began service in 1924. The diesel-powered ferry could carry 20 cars and 155 people. She belonged to Captain Elfving's company until the attack on Pearl Harbor in 1941, when the Army commandeered the ferry for laying mines in the lower Columbia River. Later the Army used the Tourist No.2 as a ferry running between Fort Canby and Fort Stevens. At the end of WWII the Army sold the ferry back to Elfving who operated it until the state of Oregon purchased the company in 1946. In 1966 the Tourist No.2 was sent to Alaska and used as a floating cannery. Rained all the last night, this morning it became Calm and fair, I preposed Setting out [from their camp at Megler Cove, near Megler Rest Area], and ordered the Canoes Repared and loaded; before we could load our canoes the wind Sudenly Sprung up from the S.E. and blew with Such violence, that we could not proceed in Safty with the loading. I proceeded to the point [Point Ellice] in an empty Canoe, and found that the waves dashed against the rocks with Such violence that I thought it unsave to Set out with the loaded Canoes -- The Sun Shown untill 1 oClock P M which ... About 3 oClock the wind luled, and the river became calm, I had the canoes loaded in great haste and Set Out, from this dismal nitich where we have been confined for 6 days passed [Megler area] ... proceeded on passed the blustering point [Point Ellice] below which I found a butifull Sand beech thro which runs a Small below the mouth of this Stream is a village of 36 houses uninhabited by anything except flees ... as the tide was Comeing in and the Seas became verry high imediately from the Ocian (imediately faceing us) I landed and formed a camp on the highest Spot I could find between the hight of the tides, and the Slashers in a Small bottom [Station Camp, McGowan, Washington] this I could plainly See would be the extent of our journey by water, as the waves were too high at any Stage for our Canoes to proceed any further down. in full view of the Ocian from Point Adams to Cape Disapointment [Cape Disappointment], I could not See any Island in the mouth of this river as laid down by Vancouver. The Bay which he laies down in the mouth is imediately below me [Baker Bay]. This Bay we call Haleys bay from a favourate Trader with the Indians which they Say comes into this Bay and trades with them Course to Point adams is S. 35o W. about 8 miles To Cape Disapointment is S. 86o W. about 14 miles ... our men all Comfortable in their Camps which they have made of boards from the old Village above. we made 3 miles to day.